Most Argentinians have been born in a time of crisis. That is why one of the campaign promises that propelled Mauricio Macri to the presidency in 2015 was to wipe poverty off the national map. Before his election, Mr. Macri vowed to achieve lower inflation and “Zero Poverty,” a hope that opened the way to a resounding victory against former president Cristina Kirchner’s populist candidate, Daniel Scioli. But as the end of his first term nears, Argentina now finds itself in a worse economic situation than before the president took office, with no solution in sight. Mr. Macri’s campaign had been built on three pillars: uniting Argentinians, abolishing drug trafficking and zeroing out poverty. But poverty has only increased since he made that campaign commitment, the nation’s economy weighed down in a seemingly endless crisis. In 2018 Mr. Macri faced possibly his most difficult year in office. Measures he took to liberalize the economy, impose government austerity, increase taxes for public services and “open Argentina to world”—during a time when protectionism and nationalism grew abroad—had no positive effect. Adding to the misery, the president failed to adequately respond to a currency crisis that pushed Argentina into a new recession. The consequences of that crisis have been many. The Argentinian peso has depreciated 50 percent against the U.S. dollar, and unemployment has reached 9.6 percent. This year, according to the International Monetary Fund, Argentina will be among the nations with the world’s highest rates of inflation—accompanied by South Sudan, the Democratic Republic of Congo, Iran and its South American neighbor Venezuela. If the expectation of zeroing out poverty was unrealistic, now it is barely a dream. The national poverty rate was estimated at 33.6 percent in the third quarter of 2018, according to the Argentinian Social Debt Observatory of the Pontifical Catholic University of Argentina. The number of poor people in the country increased from 11.4 million in 2017 to 13.6 million in 2018. The Catholic University of Argentina report states that “about half the households declared that their income was not enough to cover their expenses.” The nation faces a situation of “structural poverty” that seems not to change. In a press conference, the director of the observatory, Agustín Salvia, said that “structural poverty can only be reduced by income redistribution policies, an economic model that fosters small and medium-sized enterprises, more employment and better wages.” Another study by Unicef reports that 48 percent of the children and adolescents in Argentina are poor. Economic sociologist Ana Castellani attributed the growing poverty to the fall in real income; Argentina endured a 48 percent inflation rate in 2018. Ms. Castellani is director of the Center of Workers Innovation at Argentina’s National Research Council. The increase in poverty, Ms. Castellani explains, is linked to the flagging fortunes among Argentina’s “vulnerable population,” or the “new poor” category. This term became widely used in the 1980s and 1990s in Argentina, referring to lower-class people who simply do not make enough money to cover their expenses. They are not “structurally poor” but a portion of the population that swings in and out of poverty. By liberalizing financial and exchange markets the Macri administration expected a “confidence shock” to the economy from foreign investors. Yet investments were not enough to make the economy grow. They often have a minimum level of education; they may have informal work and may even own a house. Yet they struggle every day to find work and pay the bills. “Although in 2018 there was an impoverishment in all levels, it is clear that the ones who fell below the poverty line are those who were right in the border area,” Ms. Castellani says. “Even knowing that ‘zero poverty’ was an unreachable objective, the president repeated that his government should be evaluated [against poverty rates],” she says, noting Mr. Macri’s comments in September 2016, as poverty rates spiked. There was a decrease in 2017, but it proved unsustainable. In Ms. Castellani’s view, by liberalizing financial and exchange markets the Macri administration expected a “confidence shock” to the economy from foreign investors. Yet investments were not enough to make the economy grow and generate an idealized trickle-down effect that would relieve the poor. Ms. Castellani does not believe that Argentinians’ unhappiness with the economy necessarily means they will vote him out of office in the country’s next presidential election this October. “Obviously the weak economic results and the general impoverishment of the population erode the image of the government. Surveys indicate rates of disapproval above 70 percent for the economic management. Nevertheless, that does not translate directly into opposition vote,” she says. The Macri administration manages to keep a core of faithful voters because of a communication strategy that “legitimizes” the economic crisis, Ms. Castellani says. The president has persuaded supporters that the blame can be laid on past administrations and global circumstances beyond his control. 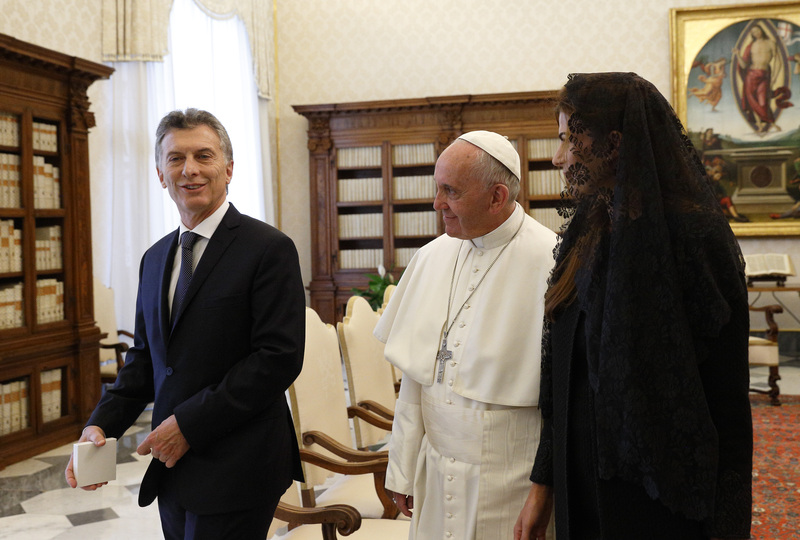 Uneasy with rising poverty in his homeland, Pope Francis has expressed his concerns to Mr. Macri several times. In a private audience in 2016, they discussed aid for integral development; respect for human rights; the fight against poverty and drug trafficking; and justice, peace and social reconciliation, according to a Vatican press release. A political theologian and professor at the Pontifical Catholic University of Argentina and at Boston College, Emilce Cuda says that Catholic bishops in Argentina are especially attentive to the rise of unemployment among youth and seductive offers from organized crime during hard times. “Without formal employment, young people are captured by the informal market or drug trafficking,” she says. In a private email sent in early 2015 to his Argentinian friend Gustavo Vera, who assists victims of human trafficking, Pope Francis wrote that he was “terrified” by the growing power of drug dealers among young people. According to Ms. Cuda, the Argentinian bishops’ conference is in constant dialogue with Mr. Macri’s government because of the church’s charity and social work. But it is not always supportive of his government’s policies. In response to growing violence, for example, the Macri administration is seeking to reduce the age of criminal responsibility from 18 to 14 years old, a measure which the bishops’ conference officially opposes. Argentina’s bishops instead support broader programs to contain poverty, drugs and crime. “Pope Francis consistently says that politics is the highest form of charity,” Ms. Cuda says. What about the Kirchnerists? How could you not mention that? You’re implying of course that Macri’s liberalization of the economy and austerity measures are mostly to blame for the worsening of poverty, while saying that his blaming of the previous administration has been just a public image campaign of “persuading supporters.” The Kirchnerists left the economy in downfall and emptied the country’s currency reserves, despite their own insistence that the economy was growing with fake statistics (apparently a family of 4 could survive on 10 pesos per day or something like that). Really, you appear much too one-sided here. Macri has not done well with the economy, this is the big disappointment with his presidency. And the response to the currency crisis was weak as you said. But this article appears too partisan and one-sided. Did you at least send it to friends on the other side of the ideological spectrum? I suspect not. As it is, this thing is half-baked and one-sided. Thus wrote Mahatma Gandhi: "Nature provides sufficiently for everyone's need but not enough for everyone's greed." This article also appeared in print, under the headline "Far from 'zero poverty' ambitions in Argentina," in the February 18, 2019 issue.